On December sixth we celebrated Krampusnacht. Krampus is a fabulous creepy Christmas character. And since we aren’t into any of the Krampus punishing bad kids, or the Santa rewarding the good kids (since kids are just kids), we dedicated our Krampusnacht to the hopeful punishment of the naughty children of commercialism, environmentally exploitative and extractive industries and slave labor practices. So, actually some particularly rich grown ups – short-sighted, immature ones. 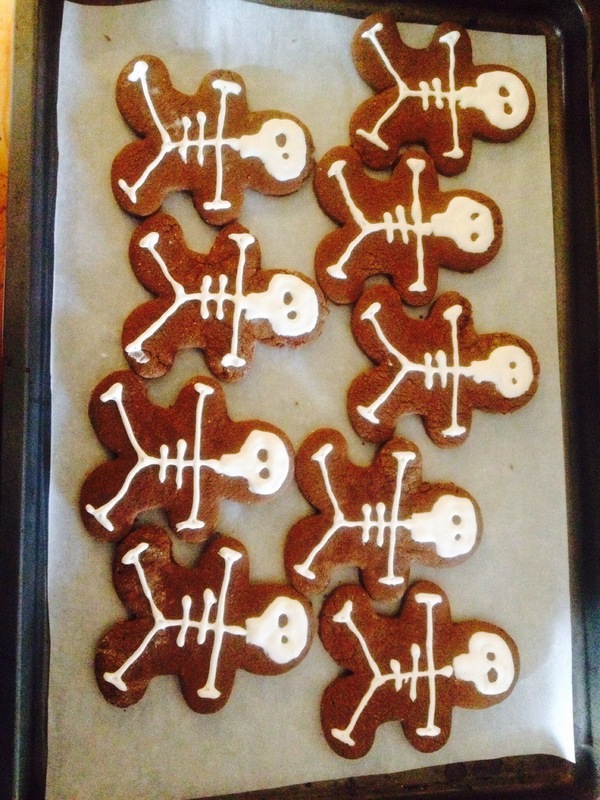 We made ginger bread people with industry names written on them, as well as skeleton ones. We ceremoniously infused some skeleton ones with the energy of banishing things that make us sad and mad that are hurtful to others and the world and gobbled up the mean people who do those things. “This cookie is for…and now I will eat the meany’s head.” We also formed and baked some tiny clay horns. Since it was the first Krampusnacht celebration we thought we can grow into the celebration with bigger horns next year! Learn more about Krampus and Krampusnacht by using your search engine skills.